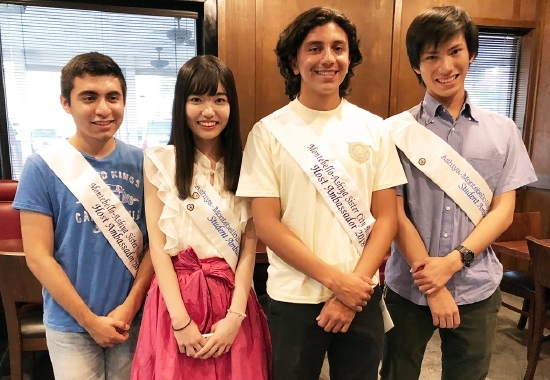 MONTEBELLO — The Montebello-Ashiya Sister City Association (MASCA) welcomed the two 2018 student ambassadors from Ashiya, Hyogo Prefecture at the Welcome Potluck Party on July 31 at the Montebello City Hall. Representing Ashiya Cosmopolitan Association, Motoka Masaki, 16, and Shinnosuke “Shin” Yagi, 15, were introduced to the sister city members and guests by MASCA President Emma Delgado. Motoka is in her second year at The Sacred Heart High School in Takarazuka, studying Japanese and world history. She is involved with the Student Council and Naginata Club. She enjoys music and watching movies and has been playing the koto since she was six years old. Motoka and Shin are living with Montebello host families for three weeks to experience daily familial life and American society. MASCA’s 2018 host ambassadors, Angel Ruiz and Zachary Bernal, will accompany the student ambassadors to activities in Montebello such as tours of City Hall, the police and fire departments, a City Council meeting, an ice cream social, and visit to the historic Juan Matias Sanchez Adobe. Other activities planned include a Los Angeles Dodgers game, excursions to UCLA, Disneyland, the Japanese American National Museum/Little Tokyo, California Science Center, and the Hollywood sign, and a beach outing, to name just a few. The pair were in the Nisei Week Grand Parade on Aug. 12 along with Angel and Zachary. MASCA’s 2018 student ambassadors, Noah Lopez and Lauren Gamboa, were in Ashiya for their three-week stay and returned on Aug. 13. The Sayonara Lunch for Motoka and Shin will be held at the Quiet Cannon, 901 Via San Clemente, Montebello, on Saturday, Aug. 18, from 11:30 a.m. to 4 p.m. The program is open to the public and tickets are $35 each or $300 for a table of 10. For information about the event, contact Gloria Haro at (323) 722-1383. In 1961, Montebello and Ashiya signed an international agreement as part of the “People to People Student Ambassador Program” initiated by President Dwight D. Eisenhower in 1956. Their respective sister-city organizations created the Student Ambassador Program in 1964 and have been exchanging two high school or college students every summer.